A vivid new portrait of the formative years that made George Washington a great leader, from a highly respected and accomplished historian who is a Bancroft Prize winner and Pulitzer Prize finalist. 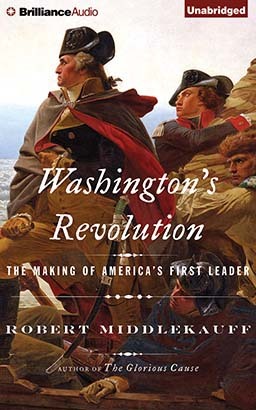 George Washington was famously unknowable, but Robert Middlekauff penetrates the mystique to reveal the fears, values, and passions that drove him. Rich in psychological details regarding Washington's temperament, idiosyncrasies, and experiences, this audiobook shows us a self-conscious Washington who grew in confidence and experience as a young soldier, businessman, and Virginian gentleman; and was transformed into an American patriot by the revolutionary ferment of the 1760s and 70s. Taking command of an army constantly in dire need—without adequate food, weapons, and, at times, even clothing and shoes, right up until the end—Washington displayed incredible persistence and resourcefulness, and evolved into a leader who understood perhaps better than anyone the crucial role the army had to play in the formation of a new American society. Washington, Middlekauff leaves no doubt, was at the heart not just of the revolution's course and outcome, but also the success of the nation that it produced. This is an essential audiobook for understanding the character of one of America's great figures.